Let me start by saying that I wouldn’t normally write another review about a restaurant this quick but this was such an amazing return visit to the Frog Hoxton that I just felt I had to tell you all about it. Our first visit was only a couple of months ago and one that we loved so much we couldn’t wait to come back. Therefore when our friends said they wanted to meet up in the Shoreditch/Hackney area our decision to return to the Frog was easy. I’m also now glad to say that our friends just like us absolutely loved it. We arrived on saturday and received the same nice friendly welcome as before. We were then escorted to our table which was in the prime location in front of the open kitchen. Our lunch started with a complimentary glass of English Sparkling Wine which was a nice touch. After a chat with our waitress Tamsin about some of the dishes we all decided to choose the Tasting Menu. This really is the best option if it’s your first time as it gives you the opportunity to sample a good variety of the dishes on the menu. We then ordered beers and cocktails from their extensive drinks list. Before our first course we got to enjoy some amazing Snacks. These consisted of Heritage Carrot , Roasted Hazelnut & Mint then Brandade , Apple & Buckwheat and lastly Crispy Duck Pancake. After enjoying some bread along with the infamous Chicken Butter it was then time for the signature dish of Celeriac , Yolk , Apple , Dates & Truffle. Along with this came a lovely surprise as Head Chef Jamie sent over an extra course the Burrata , Onion , Fennel & Espelette which was stunning. We then moved onto our next course and flavour heaven didn’t stop here as we enjoyed the Cod , Corn , Morels & Ponzu. With this came our second surprise as to accompany the Cod we were treated to the Minted Jersey Royals. Now it was time for the main course a Sutton Hoo Chicken , Spring Vegetables & Wild Garlic Dumplings and if that dish wasn’t tasty enough our third surprise arrived and I have to say the Mac & Cheese was absolute heaven. Next to come was the cheese course and the truly fantastic Cheese Doughnuts which were simply divine. This was followed by a delightful little palate cleanser called Black & Gold with BBQ Lime & Olive Oil. We then finished with some fabulous desserts the Milk , Milk & more Milk the Cassis Blackberry & Lemon Thyme and the Banana , Tonga Bean & Chocolate definitely didn’t disappoint as they were all delicious. Cheese doughnuts – yum! 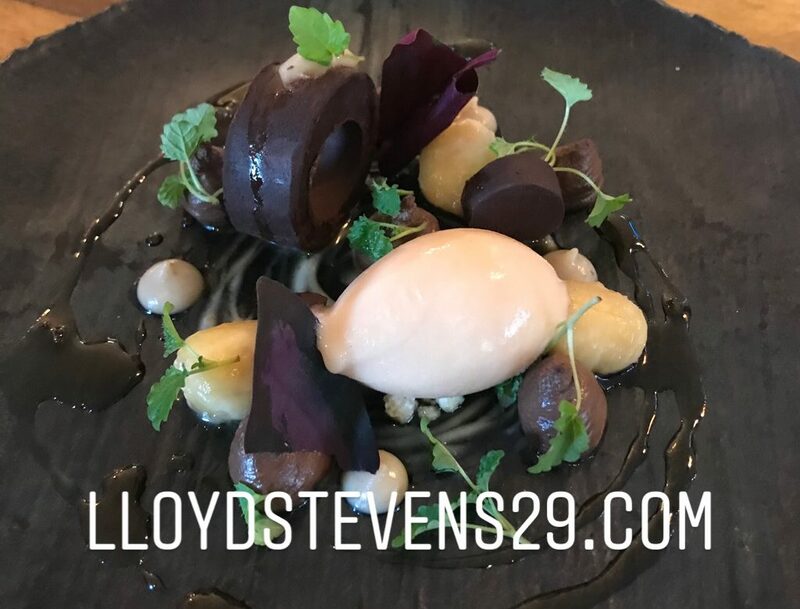 I think you’re right about tasting menus being such a great way to discover the delights on offer.